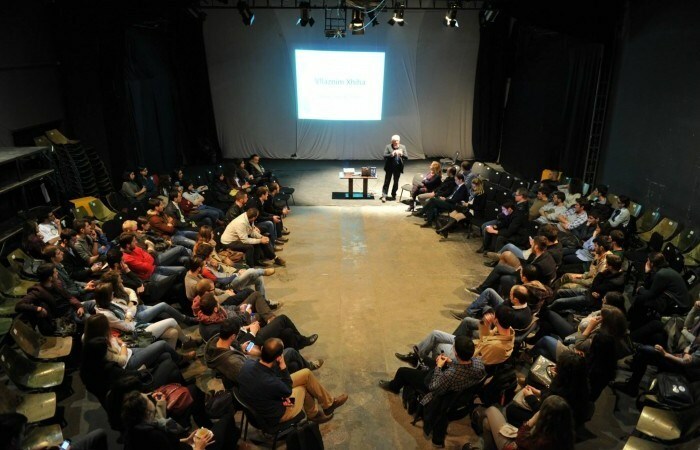 Designed with the aim of helping community to gather to share interesting ideas and experiences, BarCamp Prishtina for the seventeenth round became the gravity point where people had the chance to hear stories and advices from successful entrepreneurs. Under the spirit of Global Entrepreneurship Week this edition of BarCamp Prishtina brought in one place three personalities with different backgrounds but who share the same fate of being successful in entrepreneurship. Vllaznim Xhina, Linda Shala and Gentian Lluka rocked Oda Theatre while more than 100 people in the audience had the chance to ask and learn from their experience. He has done something that many Kosovars doesn’t do- he left Switzerland to live in Kosovo. The first thing to do after his long journey abroad was to start Encouraging Young Entrepreneurs (EYE) to support young entrepreneurs in Kosovo to build new successful companies. Vllaznim Xhina brought to this edition of BarCamp his experience and thoughts explaining the process of organizing the yearly contest “EYE Venture”. EYE Venture is designed to promote young entrepreneurs with great ideas and assists them with financial resources and expertise, through business planning process and in the initiation of their business. “The businesses are mentored through the mentoring group which consists of seven experienced entrepreneurs volunteering. Startups that are at EYE are let go after they are ready to be successful alone” he said. According to Xhina, future entrepreneurs should study management and get involved in a lot of practical work “because that’s how you learn best”. She started with a little shop in a neighbourhood in Prishtina. She was the only women in that street managing a small business. Her path toward a successful women, with a lot of power and influence in today’s economic development in Kosovo, was long. As Linda said during her presentation, being young and the only managing women in that neighbourhood wasn’t easy. “Until that time there were no women working in shops. However, one day everyone came for coffee and that’s when I started to socialize and empower my position. By helping myself I also helped other females to start working as I did”, she said. Linda also shared with BarCampers her experience as a journalist and all the way to her managing position of a very successful local companies that sell electronics. Linda ended her presentation with a powerful message for all young people in the audience saying “Invest in yourself and, most important of all, invest in your education. Education is the driving force, even though sometimes it might seem hard”. A young successful entrepreneur focused mainly on the Internet. Gentian Lluka is the owner of Telegrafi. com and also he manages other companies as well. But where did he start? He presented to BarCampers e detailed timeline with a lot of statistics of his work. He started with Topreklama, an online advertising company, to continue with Telegrafi, one of the best web portals in the market. Gentian also launched SMARD Online, an online platform to order office supplies of any sort. He ended his presentation startup Mandeta which is focused on web developing.